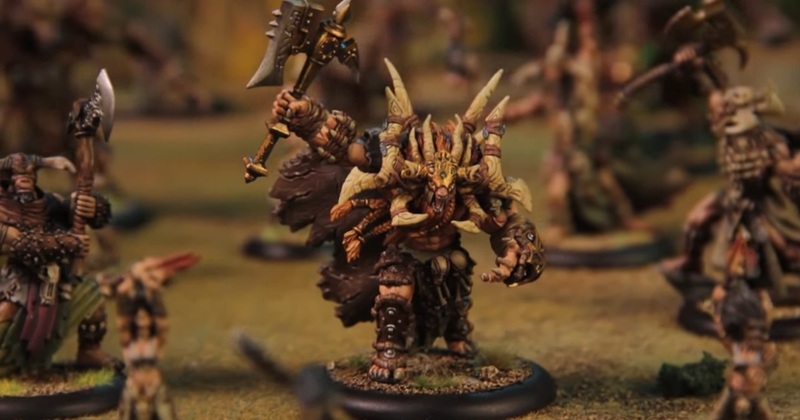 It’s time to dig into the new Theme Force announced from Privateer Press, everyone’s favorite band of marauding, barbaric members of the Circle Orobouros. The Tharn are a faction of Devourer Worm devotees who hunger for the rest of the world to fall before their ravagers and bloodweavers. And now they’re getting their own Theme Force. We’ve got a breakdown of everything coming courtesy of redditor /astroFizzics. Below you will find a list of all of the models currently included in this CID cycle. Take special note of the “things to test” section for each of the new models.These are guidelines and/or discussion points to help spark feedback. Please note that there are many more questions you could ask about these models, so feel free to get creative and do not feel like these are the only questions we wanted answered. Iona the Unseen: Iona is an aggressive warlock. She should work well with all Tharn. Her feat boosts the combat effectiveness and survivability of her fellow Tharn. Her personal threat level should be high in melee, and she should reflect the stealthy and nimble aspects of the female Tharn. Her spell list should remain flexible to deal with a variety of situations. Things to Test: Sure Foot in combination with the addition of Rapid Healing on the male Tharn. Is her feat combined with Bloodtrackers or Wolfriders over the top? Tharn Blood Shaman: The Blood Shaman is a warlock support model and a melee combat solo. She should offer useful support to the warlock and be capable in combat. Things to Test: Are all three magic abilities relevant with a variety of warlocks and army compositions. Are there any specific interactions with Divine Inspiration being applied to models that are worrisome? Tharn Bloodweaver Haruspex: The Haruspex is a command attachment for the Tharn Bloodweaver unit. She should increase the potential of the unit with thematically magical abilities. Things to Test: Does the addition of Divine Inspiration when stacked with other damage increases push the unit too far? Brighid & Caul: This unit is a Tharn brother and sister. Caul is a melee threat who also protects his sister. Brighid is the leader, a skilled hunter and archer. Things to Test: Does the unit have an interesting role in the faction and is their threat level appropriate for their price. Well of Orboros: this structure offers a variety of army support. It has a reliable ranged attack which can power up other Tharn models by giving them corpse tokens. It increases the control range of friendly models nearby. It grants a new ability to Construct warbeasts. Most importantly, it can add a model to your army during play. Things to Test: Is Opening the Gate too powerful of an ability. Does the structure offer a reasonable way to supply corpses to models in some match ups? Morvahna (1) the Autumnblade: Morvahna’s feat has been adjusted slightly to increase its impact on both enemy and friendly models. The cost of Harvest and Regrowth have been reduced, and Regrowth has been improved to better interact with the Tharn. Morvahna (2) the Dawnshadow: Scales of Fate has been changed to Control range to allow Morvahna to support more of her army. Censure has been improved slightly by preventing the damage dealt from being transferred or reduced. Carnivore was changed to interact better with corps collection and Blood Sacrifice has been slightly adjusted to close a loophole. Brennos the Elderhorn: The role of Brennos has been reevaluated. These changes are intended to make him more of a support model. The animus change to Arcane Protections allows him to guard against arced spells. The bond has been adjusted to allow Morvahna to channel spells through him. Rite of Spring replacing Condition grants him another useful support option. His cost has been reduced and his DEF has been increased. Feral Warpwolf: Points decrease and gains Pathfinder. Ghetorix: Points decrease and gains Pathfinder. Gnarlhorn Satyr: Points decrease and gains Pathfinder. Pureblood Warpwolf: Gains Pathfinder. Rip Horn Satyr: Gains Pathfinder. Shadowhorn Satyr: This model gains Pathfinder and sees a points reduction. It also exchanges its Puissance animus for permanent Beat Back and the Elusive animus. These changes should make it a more appealing option in many armies. Storm Raptor: This model is getting a power level increase and a slight drop in points. Deceptively Mobile and a change to the area affected by Sky Fire should make this model more appealing. Pathfinder has been added for quality of life. 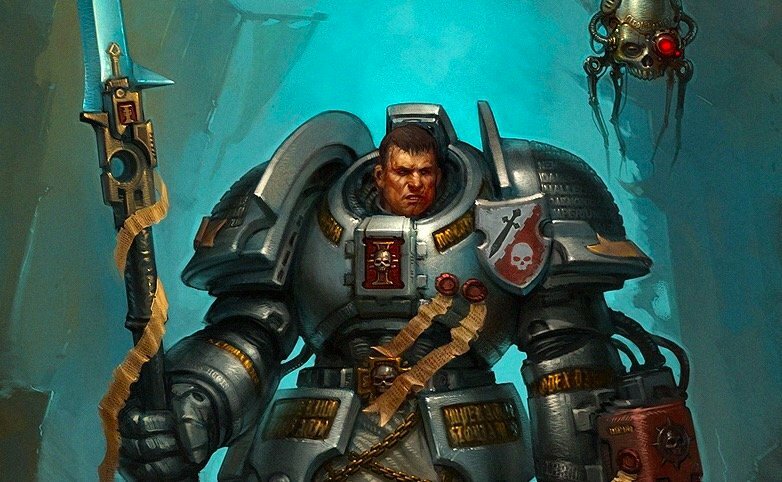 Death Wolves: Gain Advanced Deployment. Tharn Blood Pack: The role of the Blood Pack has been reevaluated. These changes are intended to make them a ranged unit. Their points have been reduced and their armor has gone up to match the Ravager’s ARM. They have gained Rapid Healing like the other male Tharn. The Range and Power of their bows has been increased and they gain Arcing Fire. Assault has been cut and they have gained Reposition [3″]. Tharn Bloodtrackers: The Bloodtrackers receive a slight points reduction and gain Parry. Nuala the Huntress: Granted: Swift Hunter is being replaced with Reposition [3″]. Hunter’s Reckoning makes the unit much more flexible. Tharn Bloodweavers: There are no changes to this unit at this time. Tharn Ravagers + Tharn Ravager Chieftain: Rapid Healing gives the Male Tharn a unique place when compared to other medium based infantry. A reduction in points and the addition of Brutal Charge should also make them a more appealing unit. Bloodweaver Night Witch: Replacing Blood Rituals and Life Drinker with Weapon Master will make this model more consistent. Adding Attack types widens the role of the model. Lord of the Feast: The power level of model has been increased. Thresher on his sword has been replaced with Grievous Wounds. He gains Death Powered, raising his max potential ARM, so his ARM was lowered. His cost increased to reflect this power shift. Tharn Ravager Shaman: Raising the CMD of this model should make it more appealing. Tharn Ravager White Mane: This model’s role has been reevaluated. These changes are intended to make him a combat support solo. He gains the same Rapid Healing and Brutal Charge as the other Ravagers, with the latter ability replacing Critical Grievous Wounds. Countercharge replaces Overtake. 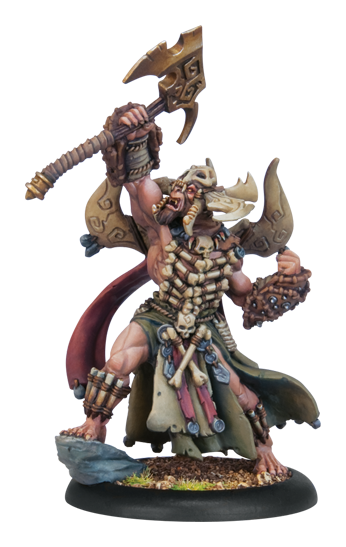 Veteran Leader now applies to all Tharn models, making him a more appealing choice in the theme force. 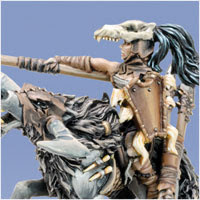 Tharn Wolf Rider Champion: This model has been adjusted to reflect the changes to the Wolf Rider unit and to support them in their new role. Prowl will help this model and the unit survive longer. Backstab makes this model a serious flanking threat. it’s cost has been reduced. The following Theme Force changes are also being tested during this CID Cycle. *Add “Circle structures” to the Army Composition section. *For every full 20 points of Tharn models/units in this army, you can add one command attachment or solo to the army free of cost. Free models do not count toward the total point value of Tharn models/units in the army when calculating this bonus.